Above: China Aviation Museum near Beijing is a good target for scouting. Wings and engines, guns and radars, and more. Photo gallery below. Beijing weather was cool and sky Olympic blue. I took afternoon trip to China Aviation Museum in DaTangShan near XiaoTangShan in ChangPing county north of Beijing. From Beijing center it took 1,5 hours drive to get there. I already knew the place from Google Earth (search 40.18145N,116.35995E). I also checked museum's web site but information there was outdated, even the phone number and ticket information. China Aviation Museum was not small, but silent, no visitors. 500 meters long Hangar Exhibition Hall inside the mountain was dark, probably saving electricity. Hangar bended like Einstein's light into banana shape. No other people. Echo inside the hangar was so good that I performed my complete onomatopoetic repertoire to aircrafts on my left and right while marching through. When I was far out on the open field two men walked towards me. No other people at sight. Their question was "Where from?" and I got chance to flex my Mandarin. Soon my touring continued again. Three hours was enough for my China Aviation Museum tour and for shooting 200 pictures. For me China Aviation Museum was a good experience, worth visiting. Photo gallery below. Comments and data corrections welcomed. These pictures were taken on February 3, 2008 at China Aviation Museum. Info panel texts are original. I used Canon EOS with EF-S 10-22mm and Speedlite 580EX. Click to enlarge. Above-1: Towards China Aviation Museum near Beijing. XiaoTangShan near museum in DaTangShan. Gate, ticket 50RMB or 5EUR/7USD. In the middle a small "jet" bends over TianHun, Sky Soul memorial. "In memory of pioneer colleagues, comrades and friends who have contributed for China national aviation and space development"
"F-6 Fighter was a supersonic fighter with twin engines made by Shenyang Aircraft Company, and it was the basic version of F-6 series. On November 15, 1964, flying this type of fighter, the PLA Air Force pilot Xu Kaitong shot down one US pilotless high-altitude reconnaissance aircraft the first time." "F-6/Dongfeng 102 Fighter. In October, 1957, MiG-19xx all-weather interceptor was chosen to be the basis of the fighter produced in China. Later, with reference to the day fighter MiG-19C, the copied fighter was redesigned. On September 30, 1959, the new fighter made its first flight, and in 1962, the first batch were delivered to the Air Force." "F-6A Fighter was the first all-weather supersonic interceptor made by Shenyang Aircraft Company on basis of MiG-19 of former Soviet Union." "F-6B Fighter was the first all-weather interceptor equipped with missiles made by Nanchang Aircraft Company." "F-6 IV was the all-weather supersonic fighter made by Shenyang Aircraft Company." Nanchang Q-5 aircrafts are based on MiG-19. Above-15: China Aviation Museum. Hangar Exhibition Hall. Western entrance top text means "Civilization of Flying"
• Exhibition on the Achievements in Air Control Construction and Development." Above-16: China Aviation Museum. Hangar Exhibition Hall. I walked in via western entrance. Hangar was about 500 meters long, banana shaped tunnel. No other visitors, no personnel, only me and my echo. Aircrafts were standing both sides like an audience, waiting. Clear opportunity. With respect I performed my complete onomatopoetic repertoire while marching through the hangar. Above-17: China Aviation Museum. Hangar Exhibition Hall. After visiting museum I found no information about this plane. Probably IL-10 twin seater ground attack aircraft, used by the PLAAF in Korean War. Above-18: China Aviation Museum. Hangar Exhibition Hall. Above-19: China Aviation Museum. Hangar Exhibition Hall. Above-20: China Aviation Museum. Hangar Exhibition Hall. Above-21: China Aviation Museum. Hangar Exhibition Hall. Above-22: China Aviation Museum. Hangar Exhibition Hall. Original fighter was designed by Nikolai Polikarpov in 1932 in the Soviet Union and used mainly during WW2. Some 8600 aircrafts were built. Above-23: China Aviation Museum. Hangar Exhibition Hall. Above-24: China Aviation Museum. Hangar Exhibition Hall. Transport aircraft by Hongdu Aviation Industry Group, based on An-2 from former Soviet Union. Flowers and poster on right, January 1976 this plane was used to scatter ashes of Premier Zhou Enlai (1898-1976). Above-25: China Aviation Museum. Hangar Exhibition Hall. "Tu-2 was the light bomber developed by the Tupolev Design Bureau of former Soviet Union and was put into service in 1943. it could load 3000kg bombs and its max range was 1800km. The PLA Air Force was equipped with Tu-2 aircraft in early 1950. 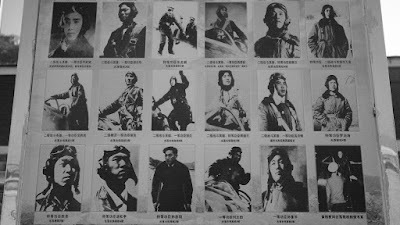 In the Korean War, Liu Shaoji shot down one F-85 jet fighter with Tu-2 piston bomber." Above-26: China Aviation Museum. Hangar Exhibition Hall. Above-27: China Aviation Museum. Hangar Exhibition Hall. Above-28: China Aviation Museum. Hangar Exhibition Hall. Above-29: China Aviation Museum. Hangar Exhibition Hall. "F-86 Sabre was a subsonic jet fighter made by former North American Aircraft Company. It was the main type of USAF fighter with swept-back wing in the Korean War. F-86 fighter was shot down the first time by PLA Air Force pilot Liu Yongxin on 25 September 1951. When the Ace pilot Davis and Double Ace pilot Fisher of the USAAF were shot down respectively on 10 February 1952 and 7 April 1953, the type of fighter they flew was F-86. This F-86 displayed here was donated by the Pakistani Air Force on 8 August 1993. Length: 11.45m Height: 4.50m Wing span: 11.90m Gross weight: 7419.5kg." Above-30: China Aviation Museum. Hangar Exhibition Hall. Out from Hangar Exhibition Hall at eastern side. "Aviation bomb is a kind of explosive ammunition having no motivity. It is carried and thrown by airplane or other aircraft. As an important weapon of bomber and fighter/bomber, it has some advantages, just like little cost, easy keeping, great power, and etc. It is always used to destroy enemy effective, technical weapon, martial building, traffic and other aims. The aviation bomb is composed with warhead, tail, detonator, and etc. Small aviation bombs weights only kilograms." Aircraft: Douglas C-47 Transport "Dakota"
Military version of Douglas DC-3. "FF-6 is the supersonic trainer developed by Shenyang Aircraft Corporation. It was first test-flown in November 1970 and delivered in January 1972. In 1960s, PLA was equipped with F-6 and F-7 supersonic fighters. The high subsonic trainers, FF-5, which were widely used could not meet the need of training. A supersonic trainer was urgently needed to be used to train pilots of F-6 and other supersonic fighters while carrying out the task of two-seat combat tasks. FF-6 was developed to meet the demand. Length: 12.915 meters Height: 3.885 meters Wing span: 9.0 meters Take off weight: 8932kg." "H-5 is a single-rotor piston helicopter made by Harbin Aircraft Corporation by referring to the former Soviet Union's Mi-4 helicopter. It was the first helicopter produced in New China. It was first test-flown in December 1958, and went into batch production in 1963. It was named H-5 in 1964. The helicopter did great jobs in various rescue efforts. In March 1966, when Xingtai Earthquake occurred, Premier Zhou Enlai took a H-5 to inspect the disaster area. Length: 25.015 meters Height: 4.4 meters Rotor diameter: 21 meters Total weight: 7600kg." Aviation Science Popularization Center. Doors not open. "Aviation Science Popularization Center of China Aviation Museum mainly displays the models of horizontal wind tunnel, smoke wind tunnel, vertical wind tunnel, water tunnel, turbofan engine, piston engine, fuel evaporation, tail rotor of helicopter, and the stunt flying simulator, air combat simulator, air-to-air missile model, airborne radar demonstrator. At the same time, there are also the charts of some planes, engines and other weapons on show." "Ground armaments displayed here include ground-to-air missiles, radars, anti-aircraft guns, and anti-aircraft machine guns. Ground-to-air missiles play a very important role in modern air-defense war. On 7th October, 1959, the PLA Air Force ground-to-air missiles troops shot down one RB-57D reconnaissance aircraft of the KMT Air Force. Both in China and in the world, it was the first time that the aircraft was shot down by ground-to-air missiles. Anti-aircraft guns and anti-aircraft machine guns are still useful in dealing with low level and low speed aircraft. Radars displayed here are aircraft warning radar, altitude-finding radar, meteorological radar and SAM radar." "Anti-aircraft artillery is the gun that fires at the target in the air from the ground or warship. In 1906, a Germany munitions company developed the first type of anti-aircraft artillery. The anti-aircraft artillery was very much developed during the World War II, playing an important role in the air defense battles. It was called "guardian of air defense". Since 1950s, mid- and large caliber artilleries have been gradually replaced by ground-to-air missiles. But there exists dead area at the low-altitude range for the missile. So the twin, quad and sextuple small-caliber self-propelled anti-aircraft artilleries have been stressed. Their shooting speed is normally more than 1,000 bullets per minute. Modern anti-aircraft artilleries have been part of a comprehensive system composed of radar, resolve and automatic aim. The shooting altitude of anti-aircraft varies from 6,000 to 20,000 meters with different calibers and models." "Red Flag No.2 was the first-generation medium and high-altitude ground-air missile system on the basis of Red Flag No.1 in 1965. The system expanded the combat airspace, raised the anti-interference ability and improved the combat ability of weaponry. The system was fixed in June 1967 and used to equip the troops. On September 8 of the same year, the system helped shoot down a U-2 high-altitude spy plane under the condition of interference. With the help of the system, our missiles also shot down three unpiloted high-altitude spy planes and one MiG-21 fighter. The successful development of the Red Flag No.2 missile system and good results in the air defense battles indicated that country's air missile system has taken to the road of independent development." "Ground-to-air missile, also called air defense missile, is a flying machine that carries guided armament to hit air target and is flied from the ground. Towards the end of the WWII, Germany successfully developed ground-to-air missile, which was not used because of the end of the war. The fourth-generation ground-to-air missiles developed in late 20th century made full use of the information provided by the C41 system to raise its counter-missile capacity in addition to the improvement in shooting range and altitude, mobility and guiding precision. Compared with air defense artilleries, the missiles have the advantages in high automation, quick response, broad control territory, shooting precision and high killing probability. The ground-to-air missiles are divided into high altitude (more than 15km), mid-high altitude (6 to 15km) and low altitude (less than 6km) in light of its shooting height." No info panel. Hmmm, wok roof on six pillars, empty seats... a saucer? "MiG-15BIS. This is the improved model of the MiG-15 made in the former Soviet Union. The plane had the engine thrust increased, equipment and control system improved, and partial structure strengthened to adapt to the higher speed. The first trial flight of MiG-15BIS was done in 1949. It was put into production in 1952. 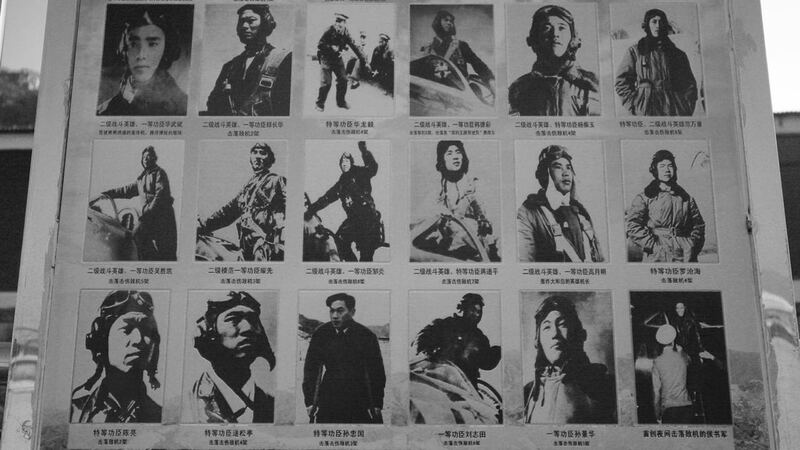 During the Korean War, Chinese People's Volunteer Army's air force was equipped with the planes, which, with their good performance, became the strong rivals of the US F-86 fighters with their good performance. Length: 10,102 meters Height: 3.7 meters Wing span: 10.085 meters Total weight: 6.106kg." "Tu-16 was the high subsonic medium-haul and medium-sized bomber made in former Soviet Union in 50 years, 20th century. It can be used to strategically bomb by carrying heavy bomb, fish torpedo and A-bomb, and also can be used to carry out air detection. In China, it was equipped in the end of 50 years, 20th century. On May 14, 1955, Yu Fuhai and Li Yuanyi aircrew, belong to the PLA Air Force, perfectly accomplished China first aerial A-bomb experimental mission by driving the plane here. Long: 34.8m High: 9.85m Wingspan: 32.989m Weight: 37.040kg Max bomb load: 9000kg Max speed: 1014km/h Max voyage: 5760km Max ceiling: 13,100m"
Above-59: China Aviation Museum. History Exhibition Hall. "If China Aviation Museum is known as an aircraft world, Famous Aircrafts in History Exhibition is a garden with various flowers in this world. Aircrafts here are flowers of flying civilization. They are brightness crystal of last century human being. Every aircraft showing its good name and legend here. Yak-11's nickname is "handsome boy in the sky". Yak-12 is called "the sky card". Yak-18's surname is "the desk in sky". Ir-10 is called "the sky tank" and seen as "the King of Terrors" by enemies because of its prowess. La-9 is a meaningful plane attended the flying for our 1950 National Day... You will go through 100-years space-time and talk to famous history aircrafts here. You will go through the wind and dust of years and listen to weather-beaten aircraft here." Above-60: China Aviation Museum. History Exhibition Hall. Above-61: China Aviation Museum. History Exhibition Hall. Above-62: China Aviation Museum. History Exhibition Hall. Above-63: China Aviation Museum. History Exhibition Hall. Lisunovs are the greens, Russian version of DC-3. "DC-8 ORBIS international flying eye hospital. ORBIS is the only charitable, non-profitable international organization. At the early time of its establishment, this organization established the international flying eye hospital and set up a mobile medical team to cure patients. It was the example for eye operation, exchange research achievements, popularizing the knowledge of ophthalmology. In the first decade, the flying eye hospital reached 70 countries successively, trained more than 25000 eye doctors and nurses, operated on the eyes of 18000 blind people free of charge and restored vision to most of blind people. The heads of state in the world thought highly of the ORBIS' contribution." Aircraft No. 4134 / 225008 Tupolev Tu-4 bomber with drones. The TU-4 is amazing! Sources say that at least one was a "gift" from Stalin, himself. "Be-6 long distance bombing plane on water. Test flights in 1949, into use 1950. This plane had been used in flight shows for Zhou Enlai and Deng Xiaoping and other party and country leaders. 8 crew members, 5 pcs 23mm guns, 4000kg deep water bombs, 4800km max flight distance, 6100 meters practically used flight height." Aircraft No. 9886 Beriev Be-6 seaplane by the Soviet Beriev OKB. Above-85: China Aviation Museum. Management building. - Take me to my Polikarpov! Above-87: Speeding towards home in Beijing. I am not a pilot but have small wings. In the hangar my onomatopoetic repertoire honored two lines of amazing aircrafts. No applaud, just echo from the dark, the silver thread of these aircrafts was already broken. For me China Aviation Museum was sparring and refreshing experience. Above-1: Fighter jet monument. East of East Ring-3 close to BTV Tower, near WTC and CCTV Tower aka DaKuCha. Above-2: Fighter jet monument. East of East Ring-3 close to BTV Tower, near WTC and CCTV Tower aka DaKuCha. Above-3: Aircraft monument, Air Chang-An aircraft. DaYangFang retail shopping area at Ring-3 South-East corner, in from ShiLiHe bridge.